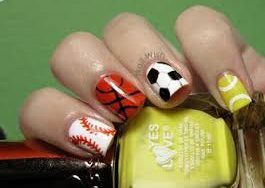 Take a look at 20 cool and funky nail art designs that will change the way you look at sports! If you are looking to add some punk to your overall look, if you are tired of the same old monochrome nail art, and if you are a sports lover then get ready to get inspired. Zuri brings to you 20 funky nail art designs that draw their inspiration from the world of cricket, basketball, baseball, swimming, tennis and what not. From simple to elaborate, easy-to-do and embellished designs, we have got them all for you. 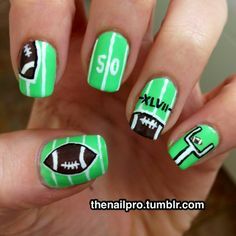 So, whether it’s the football season that is making you and your friends go crazy or the IPL fever, there is no better way to show your team spirit than with these really cool and fun nail art designs. Let your fingernails do all the talking! Get inspired by these 20 fun and ‘sporty’ nails and take the world by storm. Show off your knowledge and passion towards the favorite team by flaunting the logo of the team you support or the uber-cool sports icons. Whether it is cricket or wrestling, whichever sport you fancy, just remember that there is a nail art pattern to go with your choice or interest. Team it up with a pair of jeans and white shirt or the jersey on the day of the event. Put on some basic makeup, for instance an eyeliner, a lip gloss and a blush in summer shade. Get into a stylish pair of pumps and secure your hair in a high ponytail. That’s it! You are all ready to cheer the team! Celebrate the baseball game with cute ball motifs by opting for the decals or a freehand drawing of the ball stitches! Create a soccer or a football on your nails and the flag of the country you belong to. Wear tennis nails for a serve or show off your putting skills by decorating your nails golf-style. A volleyball with your favorite player’s number is a cool idea too. 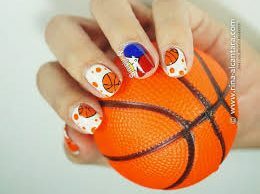 Basketball net can also get a chic makeover via simple nail art design. Infact, even chess, cycling, archery, swimming, gymnastics, cricket and traditional wrestling can be flaunted in style with your fingernails. So, girls, have heaps of fun while you enjoy your favorite game. Now, sports has got a new meaning in the world of beauty!